When you’re standing on deck staring holes into the ocean, focus is everything. 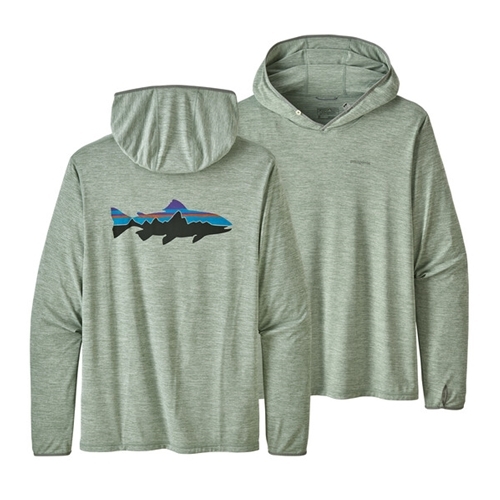 Our Tropic Comfort Hoody II keeps you from being distracted by heat and sun exposure. It’s now made from fast-drying, ultralight Capilene® Cool Daily fabric—prints are 100% recycled polyester, heathers are 100% polyester (50% recycled)—that stretches with your body, provides 50+ UPF sun protection and wicks away perspiration. It also floats over the skin with a soft, cotton-like feel so you can stay cool and concentrate on the fishing. The generous hood design fits over a baseball cap, while long sleeves and thumb holes cover hands. The TCH II is the simple, one-piece sun solution for anglers who’d rather not mess around with gloves, neck gaiters and broad-brim hats. Now made with Fair Trade Certified™ sewing. on 8/20/2017 Cool all day!